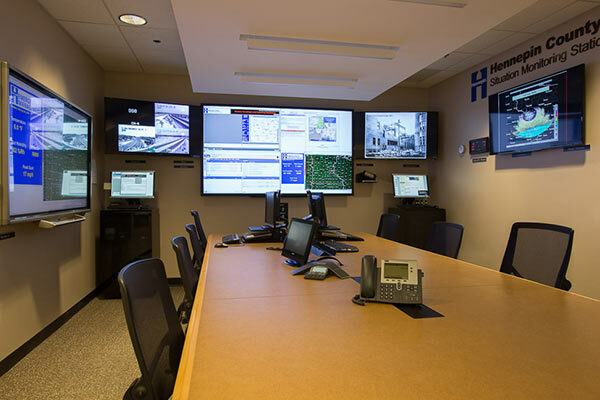 Previously, there was no room in the facility that allowed operators to quickly display multiple visual data sources during a crisis or a training session. RGB Spectrum’s MediaWall® 4500 video display processor allows the room to display up to 18 sources across a 1x4 projector wall with a click of a button. The QuadView® multiviewer allows the operator to recall any four sources to a 60-inch LCD displays in separate situation monitoring rooms during potential emergencies. For the integrator, quick installation, easy set up and quality of processing were the key benefits. See how RGB Spectrum's products support critical decision making in command and control rooms and operations centers.